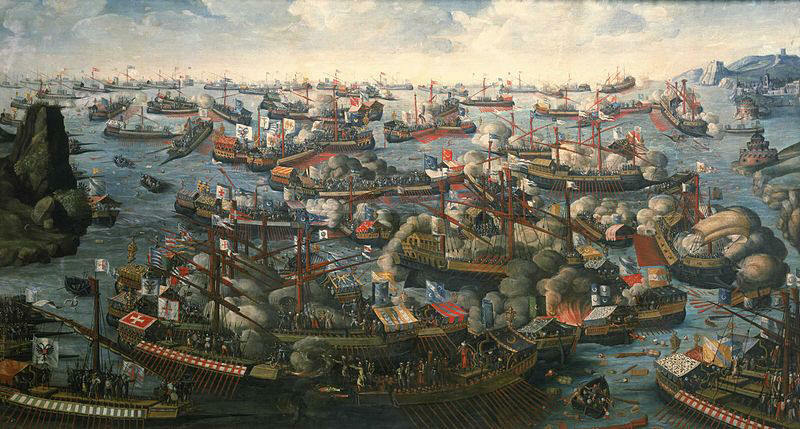 Today we celebrate the feast of Our Lady of the Rosary, on the anniversary of the Battle of Lepanto, on this day, Sunday, October 7th, 1571, when the Catholic forces of Europe won a decisive naval battle against the Ottoman Turks in the northern part of the Gulf of Corinth, just west of Greece. For over nine hundred years, Moslems had been invading the nations of Christendom, particularly those in proximity to the Mediterranean. Rome itself was sacked and looted in the year 846 A.D. Not only was Christian property threatened, but Christian souls as well, for those kidnapped were often placed under great pressure to adopt the false religion of the Turks. This decisive naval battle deprived the Turks of their stranglehold on the waters and lands around the Mediterranean. The victory is likewise significant in that the forces of Christendom had been split by the schism between Rome and Constantinople, and more recently, by the loss of European nations to Protestantism. It was remarkable that the Pope could raise an adequate navy. Pope Saint Pius attributed the victory to the great number of people who were praying the Rosary of the Blessed Virgin for the success of the Catholic fleet. But Lepanto was not the first victory attributed to the Blessed Mother of God. In October of 911 A..D. she is said to have protected the faithful of Constantinople by draping that city in her veil and keeping the Moslems at bay. In 1683 the Moslems were repelled from the gates of Vienna by John Sobieski under the patronage of our Blessed Lady, and Pope Innocent XI instituted the feast of the Holy Name of Mary. In 1716, Clement XI inscribed the feast of the Rosary on the universal calendar, in gratitude for the victory gained by Prince Eugene in Serbia, on August 5th, the feast of Our Lady of the Snow. More recently, at Hiroshima, on August 6th, 1945, a group of German Jesuits survived the nuclear bomb blast in a house that was a mere eight city blocks from the explosion site. Everything around, except for their house, was leveled, and a half million people died. The Jesuits attributed their protection from the blast to the fact that they recited the Rosary together every day. No doubt there are other examples of Mary’s maternal protection of those who pray her Rosary. Albigensianism was particularly difficult for men and women, as we are creatures made up of both spirit and matter—creatures, therefore, (according to these heretics) in perpetual conflict between the good and the evil within us. In theory, the Albigensian remedy for this conflict was the “liberation” of the spirit by starving one’s self to death, through suicide, or consenting to one’s own murder. Marriage was thought to be particularly evil, for it trapped young new souls in material bodies. Like ritual murder, abortion was highly recommended. In practice, the perception that a good life is so nearly impossible, leads to the opposite sort of behavior—if my material side damns me no matter what I do, I may just as well go and enjoy myself through whatever material excesses are available to me. The praying of the Rosary, of course, caused men and women to recognize that God’s plan for human salvation was material as well as spiritual. God became man! He took material flesh in the womb of the Virgin Mary. The preachers would add that before He suffered on the Cross He promised His flesh and blood to eat and drink, and gave them to us at the Last Supper, the forerunner of Holy Mass. Even the separation of his body and soul in death was temporary, for He rose again from the dead only a few days later. Not only did He rise, but He ascended body and soul to heaven. And, so did His holy Mother, where she would be crowned Queen of Heaven! Certainly, the human body, childbirth, and human life could not in themselves be evil things—for they were things willingly experienced by God Himself, and His holy Mother. Our society seems to be oriented in the opposite direction from the Albigensian heretics—but, quite likely, we are as far from the “golden mean” of virtue as they were. Mistakenly, many of us hold up material possessions as a sign of divine favor. But, curiously, we mimic the sins of the Albigensians. Many are eager to prevent or destroy their own children, or to engage in relations incapable of producing children—they abuse themselves with drugs—and, when life becomes too uncomfortable, they seek to kill themselves, or have themselves killed by medical assassins. If it worked for the Albigensians, the Rosary ought to work for us as well. And it ought to work for the Modernists and the Socialists as well. Today we have the scandal of Catholics and Catholic churchmen who share the ideals of their materialist brothers and sisters, who no longer believe in the perpetual virginity of Mary, who no longer believe in the possibility of miracles, who question the fact of our Lord’s resurrection from the dead, who view “the United Nations [not Jesus, not Mary, not the Church] as the last hope of concord and peace,” who turn from God to Socialism to serve the people of the world in a New World Order—a Novus Ordo Mundi. Saint Dominic prayed the Rosary eight-hundred or so years ago, and converted many of the Albigensians. Pope Saint Pius V prayed the Rosary four-hundred-forty-one years ago today, and the battle for the Mediterranean became a Catholic victory. General John Sobieski prayed the Rosary in 1683 and liberated Vienna. Sixty-seven years ago a handful of Jesuits prayed the Rosary and survived the atomic bomb! It is now our turn to pray the Rosary, so that through the intercession of the Blessed Mother of God, the Materialists, Modernists, and Socialists of our time will return to that “golden mean” of virtue in Her Son’s Holy Catholic Church. To commend His grace to us, and to destroy human wisdom, God was pleased to take flesh of a woman who was a virgin, and so to restore by like, to cure a contrary by a contrary, to draw out the poisonous thorn, and most effectively to blot out the decree of sin. Eve was a thorn; Mary is a rose. Eve was a thorn in her wounding; Mary a rose in the sweetening of the affections of all. Eve was a thorn fastening death upon all; Mary is a rose giving the heritage of salvation back to all. Mary was a white rose by reason of her virginity, a red rose by reason of her charity; white in her body, red in her soul; white in cultivating virtue, red in treading down vice; white in purifying affection, red in mortifying the flesh; white in loving God, red in having compassion on her neighbor. Mary, the Mother of God, is our Mother. Mary, our Lady of the Rosary is our Rose—let us not fail to make her a daily gift of roses in the decades of her Rosary! Pray the Rosary for the conversion of the modern world! Commemorated as Покровъ (Pokrov) or "Holy Protection" in Eastern Catholic and Orthodox Churches October 1 (n.s. ).